Relate: Just browsing along the internet the other day I came across an interesting picture. There was a boat full of whale watchers. They were on an expedition somewhere near Ireland and the cameras were all up as everyone was looking at what must have been a whale somewhere in the far distance. Meanwhile, on the other side of the boat, this beautiful humpback whale launched itself out of the water high enough and close enough that when it lands, all these whale watchers backs were going to be getting quite wet. Unfortunately not one of these whale watchers was looking in the right direction. Not one. They had the opportunity of a lifetime right before them and every single one of them missed it. React: Imagine a boat filled with people who are all looking for Jesus. They are all there and each of them has their own view, somewhere off in the distance, that they believe is the right view. You have a deist like Thomas Jefferson in the boat. He says Jesus was a great moral reformer and teacher but we need to use reason to overcome the silly superstition that Jesus was born of a virgin and performed all sorts of silly miracles. John Lennon is in the boat. He says Jesus isn’t about a person so much as what is in each of us. The actual Jesus was just someone like Mohammed and Buddha who understood truths we can all tap into. A Buddhist in the boat agrees. Jesus was an enlightened man, a Bodhisattva, who proved at the cross that he had moved beyond the desires and the trials of this life. A Muslim on the boat vehemently disagrees. He quotes the Quran: “They said in boast, ‘We killed Christ Jesus the son of Mary, the Messenger of Allah’, but they killed him not, nor crucified him, but so it was made to appear to them, and those who differ are full of doubts, with no knowledge, but only conjecture to follow, for of a surety they killed him not.” He then tries to explain how Jesus found a volunteer to die in his place while he ascended back into heaven. A Hindu disagrees with most of the others on the boat in claiming Jesus truly is divine. Just like Rama and Krishna, Jesus is one of the many “ishtas”, or forms of the divine found throughout history. Back and forth these watchers in the boat talk. They are looking off into the distance. Each is convinced that they have the final word on who Jesus is and tries to point their fellow boat mates in the right direction. In the meantime the Word has been made flesh and dwells among us. If they would simply turn around, they would simply see. The Bread of Life, the Good Shepherd, the Gate, the Living Water, the Light of the World, the True Vine, the Way, Truth, and Life, the Son of God, the Great I AM, is right there plain as day. The reality of who Jesus is supersedes and is far more beautiful than any imagined understandings glimpsed as if in the distance. All who look to Him will be saved, yet in one way or another so many have their backs turned. Do you? God I look to You. Help my understanding of You be based on who You truly are, not on who who I might like You to be. Help my understanding of the living Word always be grounded in the written Word. Jesus, You are my Savior. You are my Lord. You are my God. To me a targeting comparisement ! Be blessed! So many ideas, so many thoughts, so many beliefs, so many people searching just to understand life and all that happens to them and around them. If we could just turn the clock back in our search to the beginning of time and not stop off at a point along the way and forget to complete our journey, we could view the first man which would go back approximately 6500 years with a total restart approximately 4500 years ago, all this based on based on accepted population growth statics, one would find that the first belief was in God. What was written and passed down was that God created everything. We would find that other beliefs were derived by man based on what some man wanted just to bring some level of comfort or meaning to there life and then a following was added. We look so hard for something that is right under our nose! Thank you but I’m not a big fan of Ussherian chronology. I do understand your point. All I did was take today’s population work it backward based on average population growth and we end up at Noah’s flood which is written as a fact in the Bible. Just another fact proving the validity of what is written in the Bible. They do not see because they have not the Spirit within them. Sadly, many won’t even look. I really like the analogy with the whale watchers. Great post. Blessings to you. Great analogy here, BJ! 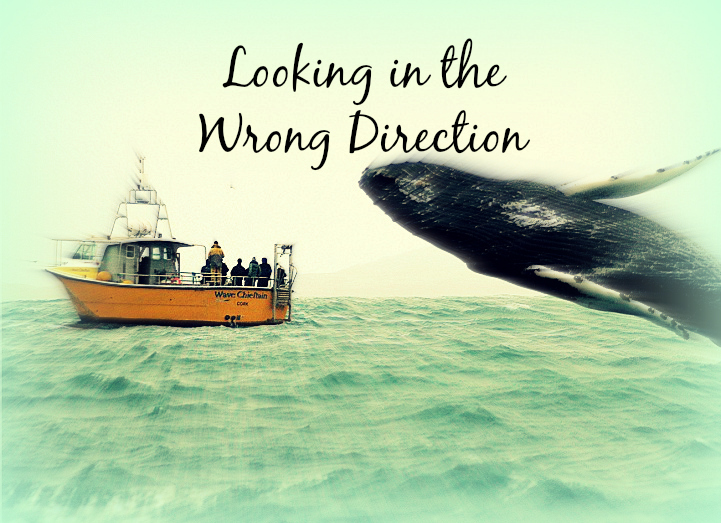 We do need to make sure we’re looking in the right direction! This scenario reminds me of John 9:41 (which I’m sure you’ll get to soon enough, BJ), when Jesus told the Jews that since they were not willing to admit their blindness and insisted they could see, their sin remained with them. John 6:28-29 (Great Works) in this post you wrote about Jesus having the words tattooed on His thigh, it is forbidden to have a tattoo, went and researched it and found that it was possibly an error and the word thigh should have been “on His banner” according to the Jewish Word for banner and thigh they start with the same letter. don’t really know as I have very little knowledge of Hebrew. shed any light on this thanks. The banner theory is pretty much rubbish as I have not seen any serious scholar ever give it any credence. It is just some wishful thinking from a few legalists who want to impose their cultural views on to scripture. i AM LOOKING UNTO jESUS, FROM WHENCE COMETH MY HELP. HE IS LORD OF LORDS AND KING OF KINGS, SAVIOR, REDEEMER, AND FRIEND. HE IS OUR SUFFICIENCY! GOD BLESS YOU, B .J.